Are you a man who’s been searching for a smart pair of ankle boots? Then you’ve come to the right place. Ankle boots are quite popular on the fashion scene at the moment, and quite rightly so with their sleek, smart design, they make the perfect accompaniment to any outfit. We think they’re suitable for both casual and formal wear, which is why many men enjoy wearing them. 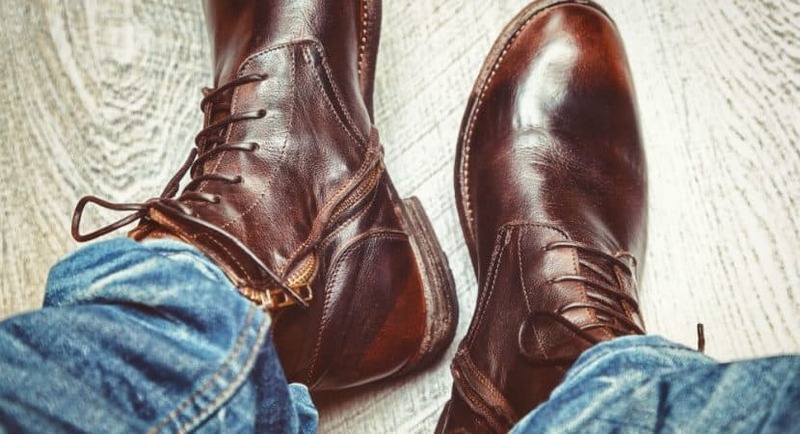 With so many different styles and varieties on the market, we know just how difficult it can sometimes be to find the perfect pair of ankle boots, and so we have done our research and found five pairs of the best men’s ankle boots currently available, which would be fitting for any occasion. Firstly, we will discuss men’s ankle boots in a little more detail to give you an idea of what to look out for before you buy, what ankle boots are usually made of, and why you can benefit from by owning a pair. Since we are focusing on men’s ankle boots in this article, we thought we would begin by highlighting some of the most popular designs of the boot currently available. As you shop around for men’s ankle boots, you will begin to notice some similarities between brands in terms of material and design. Mostly, ankle boots are designed using materials such as suede, leather, faux suede, and polyurethane. Popular styles vary from the sophisticated Chelsea style boot, which is often paired with a good pair of black jeans, to the suede desert boots which include a strong sole with heel and a lace-up design. Other styles include the leather lace-up worker boot, which can be matched up with any style of pants, as well as the biker style boot. 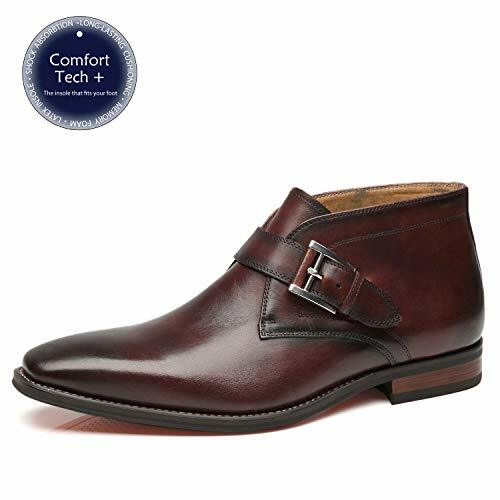 The classic leather style, without laces, is also a popular design when it comes to men’s ankle boots and one which is also popular for work wear. Whichever style of ankle boot you choose, you are bound to look smart, as the specific boot design is sleek and never too casual. There are quite a few ways you can style up your ankle boots in order to look your best. If you’re looking for a smart appearance with a comfortable fit, then the lace-up style might be for you. Whether you choose to wear them in black or brown, suede or leather, these slick boots look great with a variety of outfits. Lace-up boots seem to complement more sophisticated styles. This could be slim-leg trousers, an oxford shirt, and a sweater for a dapper look. Probably the most popular ankle boots worn are Chelsea style boots. These feature a sleek and minimal appearance and can suit formal as well as more casual outfits. To wear this type of boot for a smart look, perhaps try matching them with a pair of trousers, shirt, and a long smart jacket. For a more casual look, they can also look good paired with jeans. The biker look is also a very popular one – even if you don’t own a motorcycle. Biker boots usually feature a low heel, buck details and appear to be edgy. Try partnering these boots with a pair of skinny jeans and a neutral t-shirt. To complete the look, a black leather jacket would really set it off! This is a great outfit for the weekend or a night out in the city. 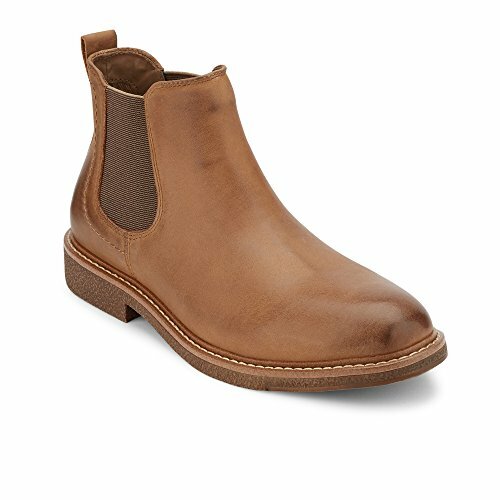 What to look out for when purchasing ankle boots? Before you start even looking for a new pair of ankle boots, you should know what to look out for. You may think that shopping for a pair of ankle boots is simple; however, if you do a little research in advance you will be able to purchase the best pair possible. Below we will give you a few considerations to think about before you continue with your shop. Do you live in a location that gets a lot of wet, rainy weather? Then perhaps a suede pair of ankle boots won’t be the best option for you until the season improves. Suede boots can easily be ruined by surface water on the ground, and this means your boots will deteriorate a lot quicker. However, there are solutions to this, which we will mention in the following point. If you do live in a rainy area, then a waterproof pair of boots might be best to go for from the beginning, in order to get the most wear out of them. Leather styles are usually the most waterproof, and so the best option to choose. However, if you really do want a suede pair of ankle boots, then you can also purchase a suede protector spray which will simply protect the boots so that rainwater shouldn’t harm them! These sprays can be found from major shoe retailers and are also inexpensive. Is height something that you like in a shoe? If so, then you can also find a good heel on many ankle boots. Some styles will be completely flat, while others can have a heel up to 1.5cm tall. This is also a feature to consider and one which depends on your individual taste. Now we will take a look at five pairs of the best men’s ankle boots. The first pair of ankle boots featured on our list is the leather Chelsea boots by Calvin Klein. These are a very slick pair of boots which will match with casual and formal styles. We take a look at them in more detail below. 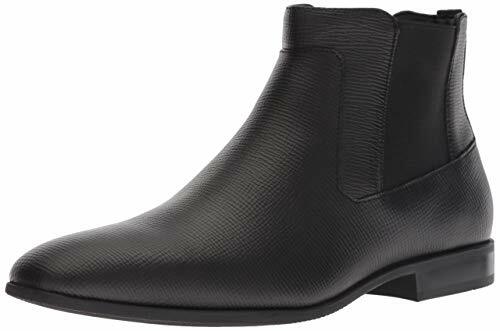 Calvin Klein is well known for making a fashion statement, and their Chelsea boots are no exception! They have been carefully designed to suit most styles, whether that be a casual look with jeans or a more office-ready pair of trousers. When you purchase a new pair of ankle boots, if you are going for the classic Chelsea style, you may prefer to find a leather pair as they are usually the most popular worn of styles. These boots are great for mixing and matching with several styles and are even waterproof thanks to their real leather design! Many men also want a pair of ankle boots which will support them and give them the right amount of sturdiness they need, in order to stand up straight and look more confident. Some poorly designed boots will lack sturdiness and therefore will not be comfortable to wear, and possibly make you trip up now and then due to lack of balance provided by the boot. Do you want a different color for different outfits? Well, Calvin Klein has thankfully designed a pair of boots in both black and brown leather, so you can either choose one, or both. We think both colors are striking and bound to make a statement! The best thing about these stylish Chelsea boots is their versatility. They can easily be matched with any outfit of your choosing and will always look good. They are definitely perfect for everyday office wear, as well as any weekends away on vacation or city trips. The next pair of ankle boots featuring on our list is the tackled ankle boots by Steve Madden. These boots are a little different in design in comparison to the previous Chelsea boot and instead include a zip-up design. We take a look at their specifics below. Steve Madden is a designer from Brooklyn, NY, who creates trendy shoes which are way ahead of their time. Today, his company continues to produce trendy, stylish footwear which is popular with many! When purchasing a pair of ankle boots, you will certainly want them to be comfortable, and these tackled ankle boots are definitely that! Thanks to their leather material design and soft synthetic sole, these boots can make walking very easy and at the same time look as stylish as ever. A small heel also allows the wearer to experience increased height, bringing their confidence levels higher while providing a sturdy balance. These boots feature a zip-up style, which gives them an edgier look than the Chelsea style ankle boot. These will match with almost all of your outfits, whether casual jeans or smart trousers! Mixing and matching these boots will be a lot of fun, and you are definitely sure to make a fashion statement whenever you wear them. The best feature about these boots is their durable design. Thanks to their strong leather composition, they are very sturdy boots and can last a good amount of time. They’ll be perfect for everyday wear and also good for wet weather. If you don’t like the standard black color which is often given to the ankle boot, then not to worry as these boots come in dark grey and dark tan. This means they can match a few different outfits and will give you a versatile look. The third pair of ankle boots on our list is the Oxford Style boots by Kunsto. These are the first laced-up pair we have and are also really stylish. We take a look at these boots in a little more detail below. Are you looking for a pair of lace-up style boots? Well, look no further as Kunsto have the perfect pair for you with their Oxford ankle boots. These boots feature exceptional craftsmanship and will match most outfits. These boots have been designed using 100% genuine leather material, and feature a hand finished upper, including a pull-on tab and a side zipper to easily slip them on and off. They have also been designed with comfort in mind thanks to the soft insole as well as faux suede lining which make them so nice to wear, every day. A wood stacked heel also allows for a bit of height when walking, and gives the wearer more confidence at the same time. If you are interested in improving your everyday office wear, or simply trying a new style of shoe, then these are a great, trendy pair to go with. Thanks to their lace-up design, they give a more formal appearance, instantly smarting up any outfit. The best feature of these boots is their anti-slip sole. When wearing ankle boots, there is always a fear that they are not the best for cold weather and won’t hold a good grip. These boots, however, are very durable and can be worn even in colder, icy conditions. At the same time, thanks to their soft insoles, they are guaranteed to keep your feet warm. The Kunsto boots also come in three different colors. This includes medium brown, dark brown and finally, light brown. This gives the wearer a better selection to choose from and the chance to buy a pair in more than one shade to match your favorite outfits and styles! The penultimate pair of ankle boots on our list is the Stanwell leather slip-on boots by Dockers. These ankle boots offer something a little different to the other boots on our list and include a very nice NeverWet feature. These boots developed holes in the sole not too long into ownership. The material also made the shoes less breathable. Dockers have been making footwear and accessories since 1986 and specialize in making versatile, essential styles. Their Chelsea boots are really trendy looking, as well as smart, and are guaranteed to improve any outfit. When wearing boots, it’s nice to wear a pair which are comfortable. Luckily, these boots have been designed to be very nice to wear, especially for everyday use. A cushioned sponge EVA heel pad makes sure your heel is nice and cozy, while a fusion footbed features a dual density latex cushion allowing for exceptional, long-lasting comfort. Unlike the previous shoes on our list, this pair of boots is treated with the fantastic ‘NeverWet’ protection. This is a revolutionary water and stain guard which instantly repels any water or liquids, giving you much better protection from the elements, meaning you can easily wear them in wet weather. This also protects your shoes from any spillages, keeping them in great condition for longer. Durability is also important in an ankle boot, and the Chelsea boots by Dockers can be counted on once again in terms of their durability. These boots have been designed with artificial leather, and feature a rubber sole which gives the appearance of authentic crepe. This sole also includes a small heel which will give some height to the wearer. Dockers has designed three different colors of their Chelsea boots, which include dark brown, black and light brown. This gives the wearer more options to choose from, as well as the opportunity to purchase more than one color, and mix and match until their heart is content! The final pair of ankle boots for men featured on our list is the Ankle dress boots by La Milano. These boots are certainly very stylish and feature a more formal look. We take a quick look their specifics below. Since 2003, La Milano has made it their mission to make innovative footwear for men, and strive to make the most durable, stylish, and comfortable shoes possible. Their ankle dress boots are definitely high-quality, and are also offered at a reasonable price! La Milano prides themselves in comfort tech technology. This means their boots have been designed to be extra comfortable, and you will get a lot more wear out of them, in comparison to a standard pair. These boots feature three individual layers which help create a super cozy shoe. This includes a layer of memory foam, a latex insole and finally a latex heel cushion. La Milano’s ankle boots feature a timeless design. Firstly, they have been designed using premium Argentinian leather with a brushstroke finish. This is such a nice material, and gives the shoes a very classic look overall! There is a shiny buckle on the side of each shoe which can easily be adjusted for a better fit, as well as premium style stitching in the shoe which finishes their design off nicely. These boots offer a very sophisticated look, making them perfect for work, vacation, formal events such as weddings and ceremonies, as well as casual events. They are so versatile and can easily be matched up with a number of outfits. Having boots which are easy to wear is also important. As these boots don’t feature any straps or laces, that makes them quite easy to wear. Their simple slip-on style makes them favorable for everyday use as they can be put on quickly and easily without spending too much time having to worry about laces or buckles. The La Milano ankle boots also feature a very strong sole. This is made of a strong rubber composition and is perfect for walking on icy or uneven ground thanks to its anti-slip properties. These boots are therefore great for wearing in the winter months and will keep your feet warm at the same time. 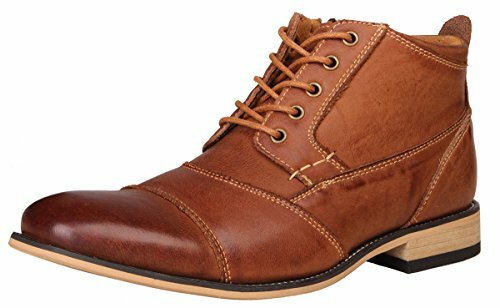 Which are the best men’s ankle boots for me? To finish, we think that all five pairs of ankle boots featured in this article should to improve your wardrobe, whether you are at work, vacation or simply strolling in the park! However, if you are shopping on a budget and would like to buy a pair of boots which are the most reasonably priced, there are some which are perhaps more suited to you. 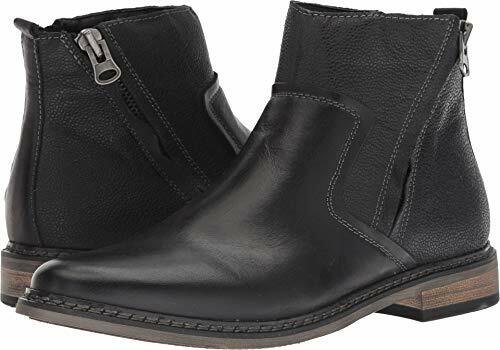 The Kunsto leather Oxford ankle boots, for example, are more inexpensive than the Calvin Klein Chelsea boots. This is of course down to the brand being so ‘high fashion’, which of course gives it a higher price tag. The ankle dress boots by La Milano are also reasonably priced in comparison to some of the other brands and given that they have been designed with Argentinian leather, they are a pretty good deal! All of the boots on this list, no matter the brand, are sure to match your outfits, and can definitely help spice up your fashion sense. And there you have it. Some interesting information on what to look for when purchasing a new pair of boots, as well as some popular styles, and finally how to wear them! We hope this article has inspired you to find some new ankle boots soon, whether for work or for simple everyday use.